Well, it took all week, but I think I've recovered from my marathon Getting To Know Me post! Just a little side note, I published that post at 3:30am, fell asleep around 4, and then got up with the kids at 6:50! Needless to say, I wasn't able to take a rest during the day (kids!) and stayed up until about midnight to finish a post for Crate Paper. I did mention I liked to work under pressure, right?! Tuesday wasn't so fun, but I'm doing much better now! It's around this time of year when I like to have candles burning all day long. 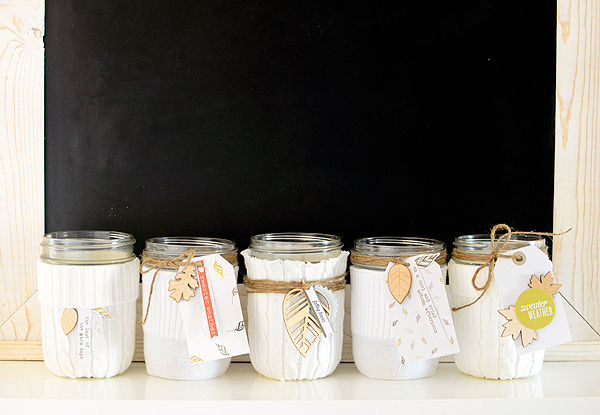 The nostalgic scents of pumpkin, apple, and spice get me in the mood for the upcoming holiday season. 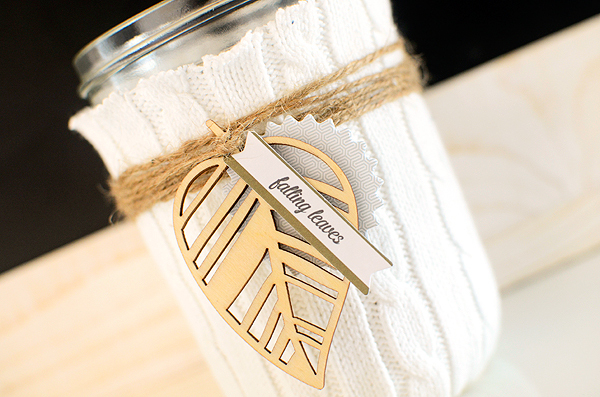 I'm sure that, as you've perused Pinterest, you've seen the cute candle cozies made from socks and sweaters. They've been bouncing around the internet for awhile now and I've always wanted to make some. So when I spotted the "sweater weather" die cut in the pack of Gramercy Road Ephemera last month, I knew it was time to give them a try. I chose a couple of my old cream-colored cable knit sweaters to start. Old, thrifted, new--use whatever is your preference, but you will be cutting off the sleeves so I wouldn't exactly recommend destroying a brand new garment. Decide what size jar you want to use. I went with 16 oz wide mouth mason jars because they have straight sides and a large rim for easy access to the candles inside of them. 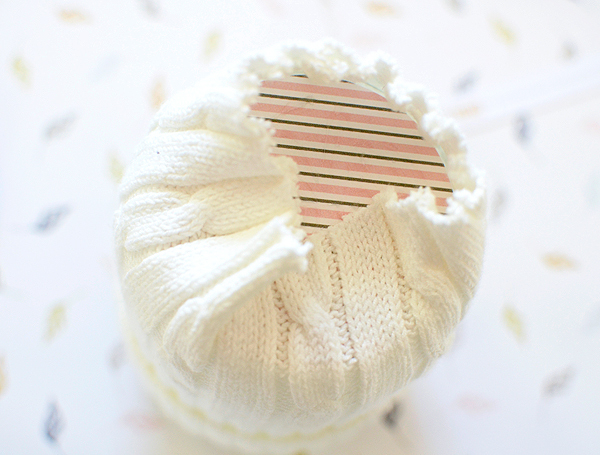 First, push the jar down into the cuff of the sweater. I folded the rim of the cuff over on some of my jars, but this is optional. 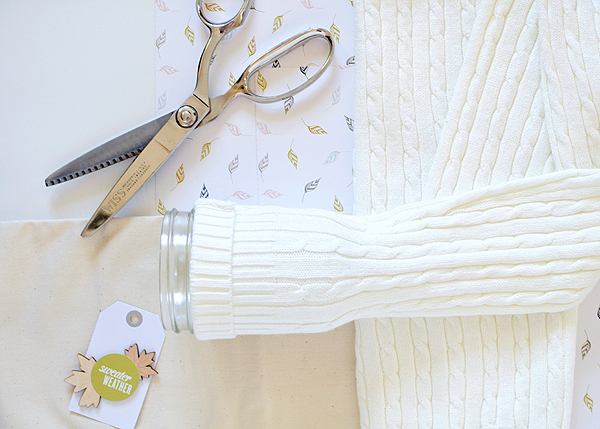 Next, using a pair of fabric shears that are sharp and strong enough to cut through the thick knit of a sweater, cut the sleeve off at 3/4" below the bottom of the jar. You can eyeball this; what you want is enough material to fold under the jar without creating a lot of bulk. If you have too much bulk, your jar will sit unevenly, which is not a good thing when there's a fire burning inside of it, right? 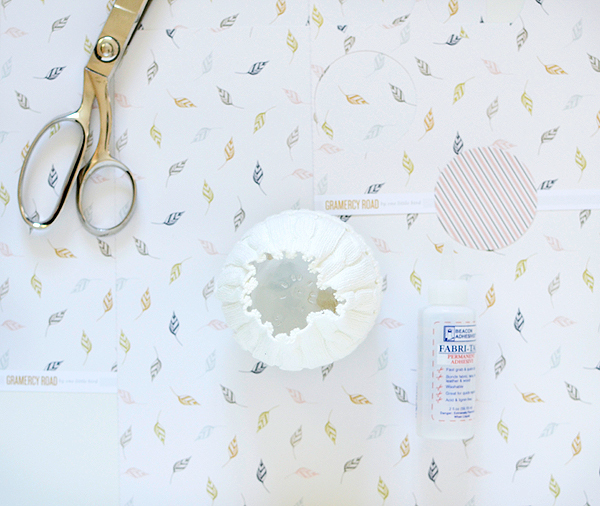 Using a die cut machine, punch, or scissors, cut a 2 1/2" circle from patterned paper. 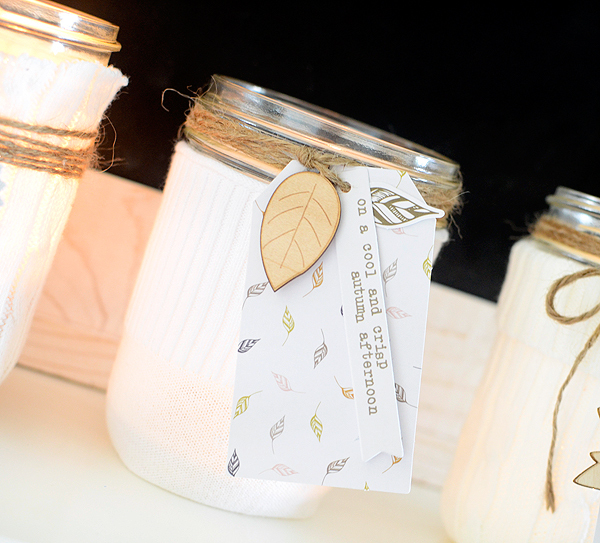 Since fall is my theme and each finished jar features a wood leaf, I chose Gramercy Road's "Cedar Creek" design for it's colorful scattered leaves. Turn your jar upside down and set the circle on the bottom. 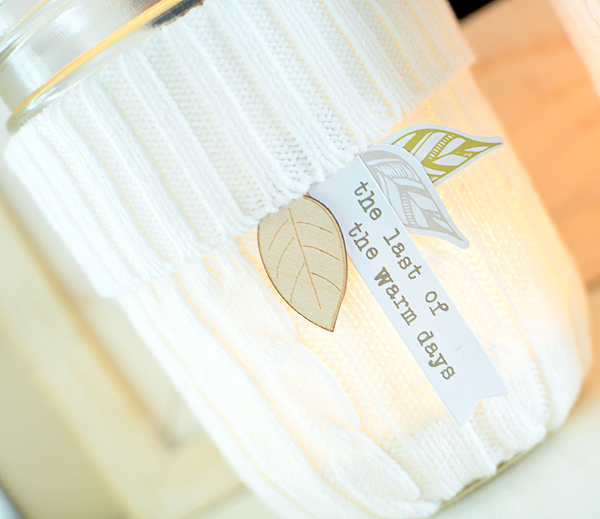 I wanted the leaves to be seen if you looked down into the jar so I covered the pink and brown striped side with my adhesive and carefully folded the sweater ends over it. For my glue, I used Fabri-Tac because it's my go-to adhesive for just about everything other than paper, but a glue gun will get the job done, too. 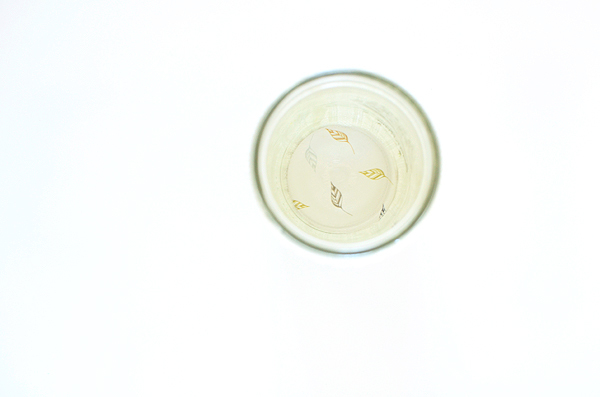 When the jar is turned upright, you see a pretty fall pattern beneath the glass bottom. You are now ready to embellish--the very best part of any project, I say! 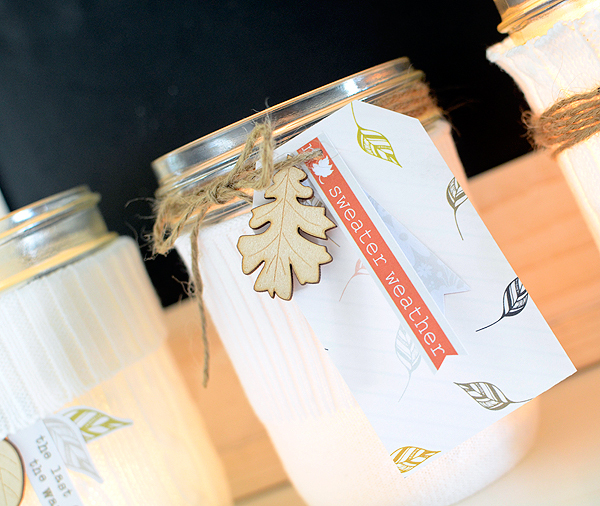 I wanted these jars to be a bit rustic and minimal so chose only a few coordinating elements. Gossamer Blue's own Gramercy Road, with it's soft-spoken color palette and warm autumn theme was exactly what I had in mind, offering subtle phrases that epitomize chilly fall days. The gorgeous wood leaves from the Life Pages Themed Add-On were a must, also. I even stole a large leaf from the pack of wood shapes in the Main Add-On. And whenever I'm going for a rustic look, I reach for my jute twine. 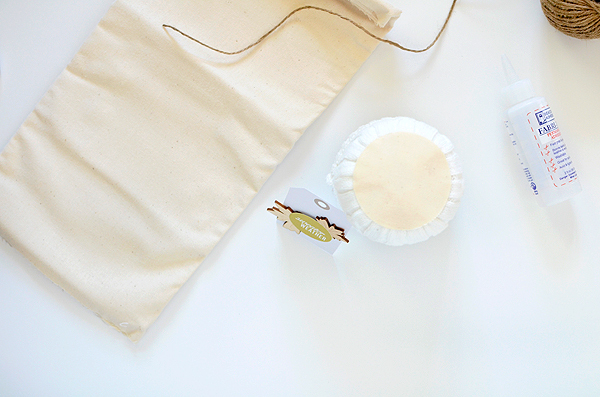 It's inexpensive, a bit messy, and the best shade of earthy brown to compliment the cream-colored sweaters. 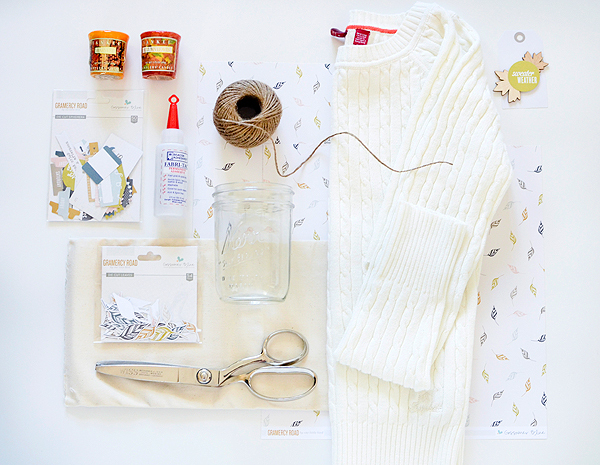 Another "sweater weather" phrase, this time from Chickaniddy Crafts out of the Add-On #2 kit. I couldn't NOT use it! While my supply photo shows votive candles, I actually decided to put tea lights in the jars instead. They sit lower so are a little safer and also provide more of an allover glow. You can always remove the embellishments if they feel unsafe to you. And of course, never leave burning candles unattended. Fall is a time of get-togethers and family gatherings. 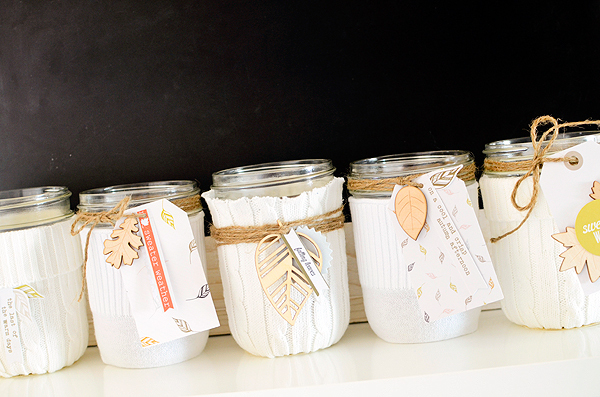 These candle jars will make thoughtful, homespun hostess gifts. 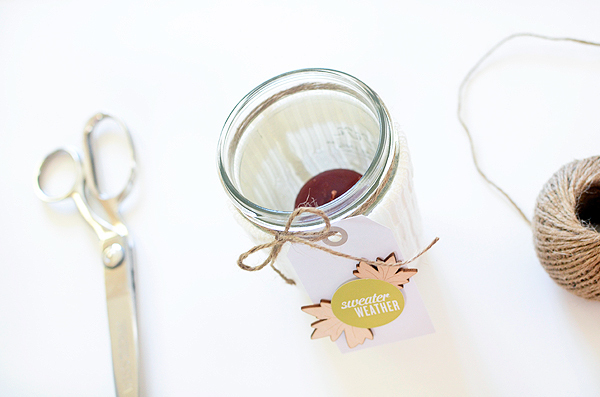 Or skip the candle and fill them with fresh chrysanthemums, fun crafty bits for your creative friends, or hot cocoa mix for the food lovers in your life. Because most of my embellishments are tied to the jars with the twine, they can quickly be switched out for Christmas decorations in December. What I loved about this project (after it was all done) was how easy it was! I stressed about it a bit before I actually tried it and then couldn't believe how quickly I got it done. 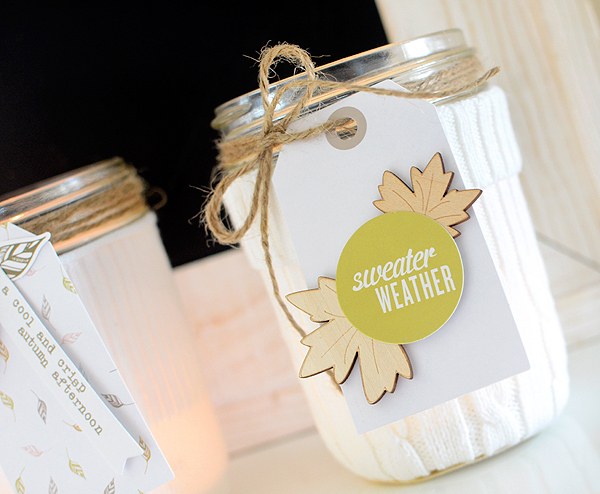 Whatever you decide to do with these sweater-cozy jars, I hope you have as much fun making them as I did! Stay warm, my friends! I love these! Especially the one in the middle. Now if I can part with one of my sweaters.. I LOVE LOVE these Rebecca! !